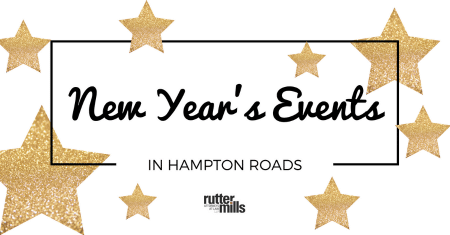 Looking to attend a fun New Year’s Eve 2016 event in Hampton Roads? Check out this helpful list of New Year’s Eve events happening throughout the region this year! This list includes family-friendly events as well as events that are just for adults. No matter what you choose to do this New Year’s Eve, make plans ahead of time to stay safe. Remember to appoint a designated driver if you plan to drink. Saturday, December 31, 206 until Sunday, January 1, 2017. Located at Virginia Beach Town Center and Pembroke Mall at 222 Central Park Avenue, Virginia Beach, VA 23462. Highlights: Festivities begin in the afternoon at Pembroke Mall. Enjoy entertainment for the whole family, including a children’s countdown and balloon drop at 5:00 PM. The adult fun continues throughout the night at Town Center with live music by headline band Smash Mouth! BJ Griffin & the Galaxy Groove, Jesse Chong, and Borderline Crazy will also be performing. A midnight countdown and a spectacular laser light show, fireworks, and Virginia Beach Ball Drop will ring in 2017. Saturday, December 31, 2016 until Sunday, January 1, 2017. Located at The Founders Inn and Spa at 5641 Indian River Road, Virginia Beach, VA 23464. Highlights: Enjoy the Annual New Year’s Eve Gala featuring the 10 Spot Band. This year’s theme is Great Gatsby with a 5-hour open bar, champagne toast at midnight, elegant dinner, overnight accommodations, New Year’s Day brunch and a late checkout of 2:00 PM. Located at Virginia Beach Resort Area at Virginia Beach, VA 23451. Highlights: Come celebrate the New Year in Coastal Virginia style. Dive into the season with a drive down the Virginia Beach Holiday Lights on the Boardwalk, take a visit to the Virginia Museum of Contemporary Art and get up-close with history at the Military Aviation Museum and Historic Houses in Virginia Beach. Finish out your weekend with a visit to the New Year’s Eve Bash and the New Year’s Eve Gala. Virginia Beach is truly the place to savor the season and kick off the New Year! Contact Phillips DMC at 877-440-0202 to customize your New Year’s Eve package at one of several Virginia Beach hotels! Saturday, December 31, 2016 from 9:00 PM until 2:00 AM. Located at Half Moone Cruise and Celebration Center at Norfolk, VA 23510. Highlights: This year’s event will take place at Half Moone Cruise & Celebration Center. On New Year’s Eve, just before midnight, guests will say goodbye to 2016 with a live countdown on projection screens, balloon drop, confetti, party favors, and a midnight champagne toast will be provided to VIP guests. Saturday, December 31, 2016 from 9:00 PM until 2:00 PM. Located at FM Restaurant at 320 Granby Street, Norfolk, VA 23510. Highlights: Join Fresh Radio as they Present their 5th Annual New Year’s Eve Sneaker Ball, dress up and dance the night away in their favorite sneakers. There will be a complimentary midnight toast and party favors. Saturday, December 31, 2016 from 12:00 PM until 1:00 PM. Located at the Kroc Center of Hampton Roads at 1401 Ballentine Boulevard, Norfolk, VA 23504. Highlights: A family friendly celebration! Highlights include pizza and snacks, music, games, a balloon drop, and more! Saturday, December 31, 2016 from 9:00 PM until 12:30 AM. Located at The Sheraton Downtown Norfolk at 777 Waterside Drive, Norfolk, VA 23510. Highlights: Bringing the 30’s back! Featuring a live band plus a special performance at the drop of the ball. Located at The Spirit of Norfolk Otter Berth at Town Point Park, Norfolk, VA 23510. Highlights: Ring in the New Year aboard the Spirit of Norfolk! Enjoy a champagne toast at midnight. Sunday, January 1, 2017 from 4:00 PM until 7:00 PM. Highlights: Kick off the New Year in a fun, healthy way. Run through 2.017 miles of spectacular light displays at the Norfolk Botanical Garden! Enjoy a Kids’ Dash, special entertainment, food, drinks and more! This run is fun for the entire family. Sunday, January 1, 2017 from 12:30 PM until 3:00 PM. Highlights: Begin 2017 on the water listening to live jazz music, dining on a delicious buffet and dancing as spectacular waterfront views surround you. Saturday, December 31, 2016 from 11:00 AM until 1:00 PM. Highlights: The whole family can enjoy this annual daytime New Year’s celebration at the Virginia Living Museum. Blast off into the New Year with a space adventure-themed celebration. Come dressed for your space adventure. Meet costumed characters from your favorite galactic movies and enjoy a variety of fun, spacey activities. You’ll also meet all kinds of Earthly Animals from the Teeny Tiny Farm. Make crafts, play games, enjoy fun activities! Located at Downtown Hampton at Queens Way, Hampton, VA 23669. Highlights: The Block Party is continuing its new tradition. At Midnight, for the third year, a lit, oversized, crab pot will be dropped! Saturday, December 31, 2016 beginning at 9:00 PM. Located at the Chesapeake Conference Center at 700 Greenbrier Circle, Chesapeake, VA 23320. Highlights: The ZAPP Band is bringing its classic soul and funk R&B groove to Chesapeake, VA and the Chesapeake Conference Center’s first NYE 2016 Celebration Saturday, December 31 presented by Smooth Flamingo Events. Doors will open at 9 p.m. with Fayetteville NC, DJ Classic Flow of Bronco IRadio.com, warming up the crowd with ‘Ole school music of classic soul favorites, getting you ready for a great weekend night of ZAPP’s sensational stage performance at 10:30pm! Saturday, December 31, 2016 from 11:00 AM until 2:00 PM. Highlights: Countdown to noon with a glittery ball drop, children’s activities and toast to the New Year at the Portsmouth Art & Cultural Center. Families can enjoy all these fun-filled, and family friendly New Year’s festivities all before bedtime. Festivities begin at 11:00 AM with a dramatic countdown to Noon followed by a toast, craft activities, music, and more! Located at the College of William & Mary at 200 Sadler Drive, Williamsburg, VA 23185. Highlights: First Night Williamsburg is a family-oriented New Year’s Eve celebration of the performing arts presented throughout the City and on the campus of the College of William & Mary. Enjoy new acts and new culinary experiences. The fireworks display will be launched from William and Mary Hall, but free seating will be in the stands at Zable Stadium on the William and Mary campus. Sunday, January 1, 2017 beginning at 10:00 AM. Located at Merchants Square Williamsburg at Duke of Gloucester Street, Williamsburg, VA 23185. Highlights: A part of Williamsburg’s First Night Celebration coming to Merchants Square in Williamsburg, VA! This New Year’s Day race has a little something for everyone with a competitive 5K race, 5K walking category, fun and festive formal wear race division (pajamas allowed), weight challenge division. All 5K runners receive a race T-shirt, post-race refreshments, and festive post-race awards ceremony.